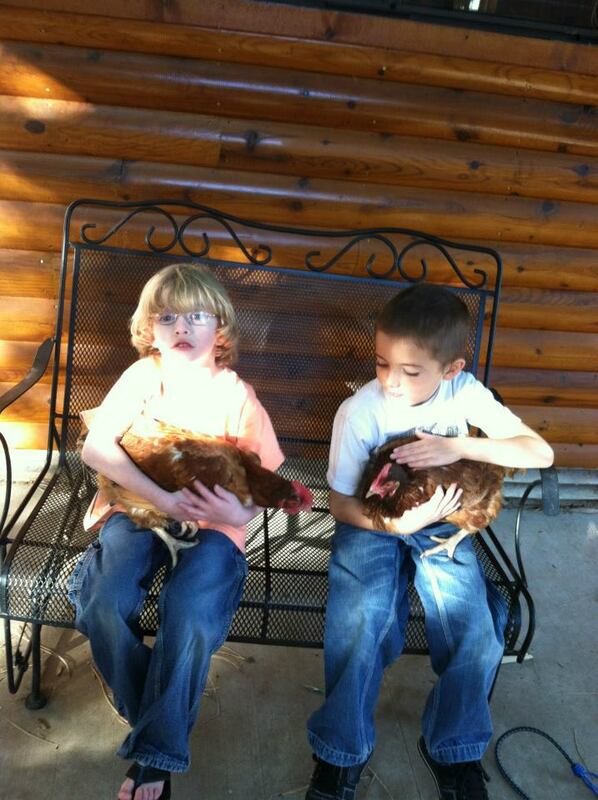 Seth and his pet chicken: "Are you scared?" There are times I wish I could attach a GoPro helmet cam to Seth. He does and says the cutest things all day long. I feel fortunate to have caught these 46 seconds of his life on video. For those of you who don't get to interact with Seth, I hope this gives you a glimpse of his sweet personality. A glimpse of his kindness and a glimpse of his love. It's been a long time, according to blogging time, since I have posted anything. It's been a busy, rough few months. We hit the year mark since Spencer started having symptoms of mitochondrial disease. Spencer is doing OK. All my kids are OK. We have been busy working with TGen and Foundation for Mitochondrial Medicine raising awareness and trying to find a cure. I wanted to write about Seth and some of the unique characteristics he possesses. I also wanted to write about some of the things that Seth has taught me. I am no scriptorian, but it appears to me that one of the themes Jesus uses a lot with his parables and teaching is children. 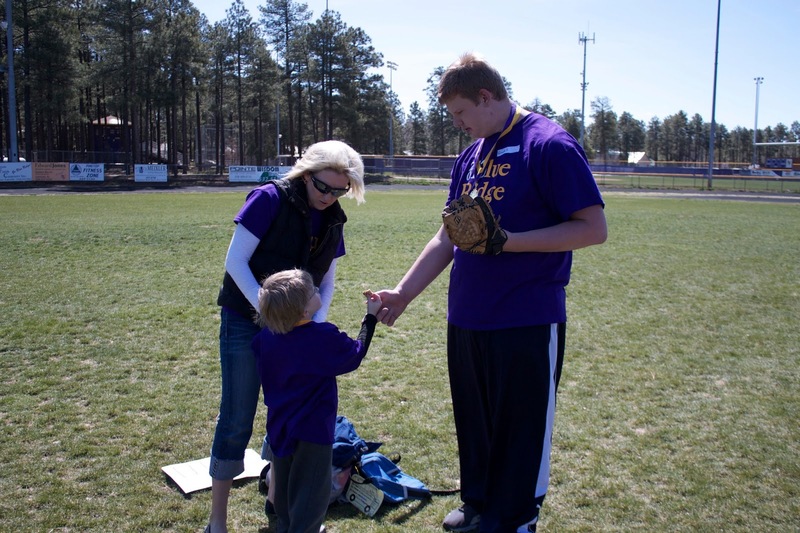 Seth participated in the Special Olympics this year. It was an amazing event! It was wonderful to be with other parents who also have children with disabilities. 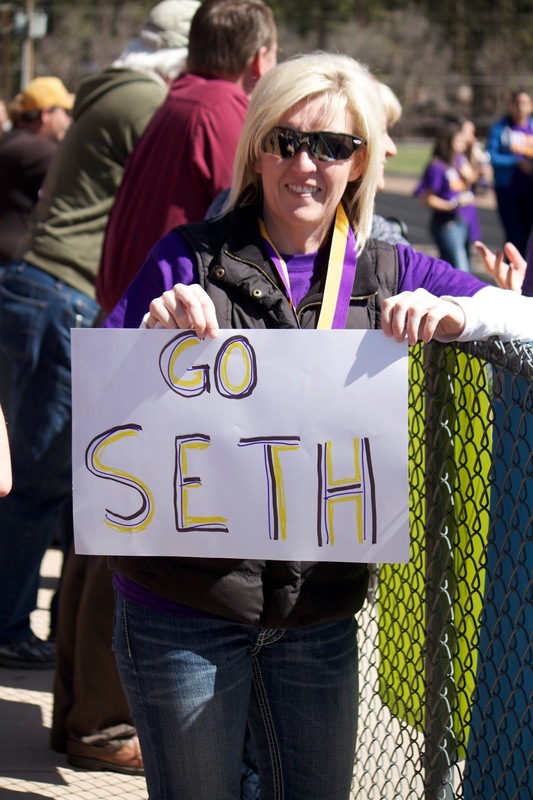 Seth's kindergarten class came to cheer him on and made signs for him. One of the highlights of the day was during the opening ceremonies. 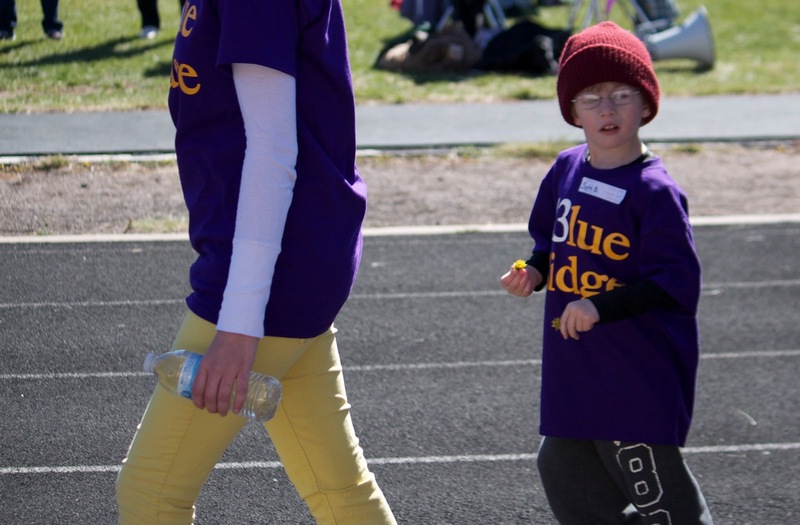 Seth helped carry the Olympic torch and walked with several other Special Olympians. During this, Seth eyes were focused on something in the grass. 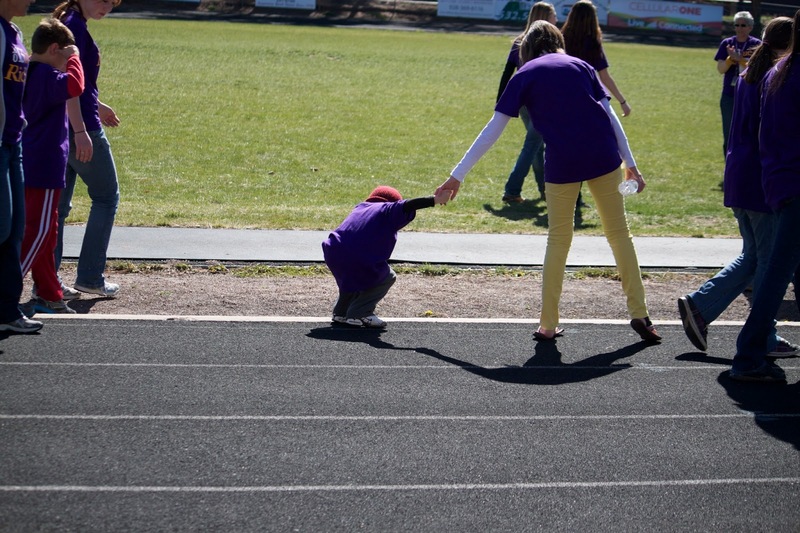 He stopped, let go of Shannin's hand (who was assigned to help him), and picked two dandelions. One for me and one for his mommy. Life is busy and full of important events. Don't get so occupied with your day to day busy activities that you forget about the ones you love. Take time to enjoy your surroundings. Take time to enjoy the beauty of nature. Take time to enjoy the ones you love. Take the time and go out of your way to show your family and friends how much you love them. Becky volunteers in Seth's class. Several weeks ago after a snowstorm, Seth and his class were at recess. Seth picked up some snow, tried to make a snowball, and then proceeded to throw the partially made snowball at one of his classmates. He hit a little boy smack in the forehead. 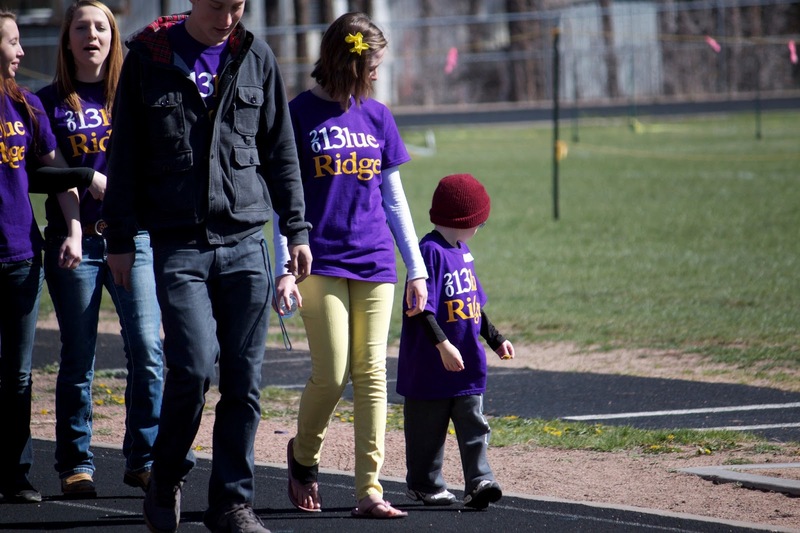 This event was witnessed by several students, Becky, and Seth's teacher Mrs. Knutson. Complete shock was the feeling that Becky used to describe the situation. Sweet Seth broke the school rules and disobeyed his teacher. Seth has never done this before. He always makes good choices. Because this situation was so unfamiliar, no one knew quite how to respond. Mrs. Knutson knew she needed to act. Many in his class witnessed Seth's blatant disregard for the "rules" and one student was...uninjured and wiping snow from his hair and face. Mrs Knutson came up to Seth and sat him on the wall and said to him: "Seth, what is the rule?" Seth replied: "Always raise your hand and wait to be called on." What is the intent of ones heart? Seth never meant to hurt his classmate, he was excited to see snow. This sweet boy who got hit with snow didn't cry. He knew Seth and that Seth would never hurt anyone. He just wiped the snow off and went on playing in the snow. Don't judge. Don't be easily offended when someone trespasses against us. 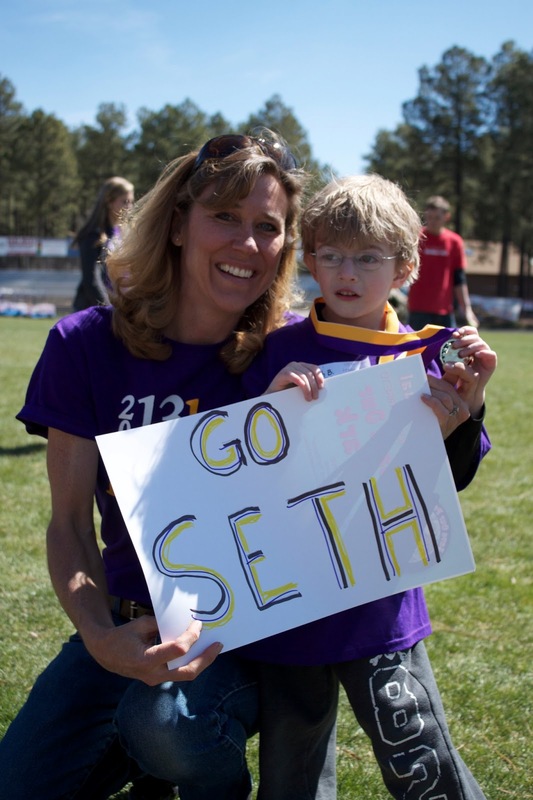 Seth has made incredible progress this year in every aspect of his life. He has the best team of teachers, aids, bus drivers, therapy dog, and therapists in the world. They love him and he loves them! I love this sweet boy. Becky calls Seth her sunshine. He brightens her day and every one's day he comes in contact with. Thank you Seth for teaching me so much about life. I am so honored to be your dad.